TENT presents the first solo exhibition by Rotterdam based -Australian artist Pilar Mata Dupont in the Netherlands. 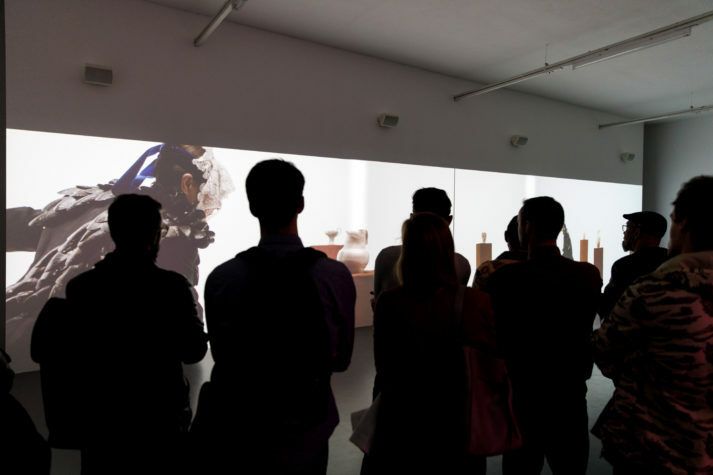 In three monumental video-installations, Mata Dupont examines the latent presence of colonial legacies in contemporary culture and in the natural landscape. Invasive plants, slumbering seeds, the red soil of northern Western Australia and a tap dancer play the leading parts. The opening of this exhibition will take place Thursday 27 september at 7pm. 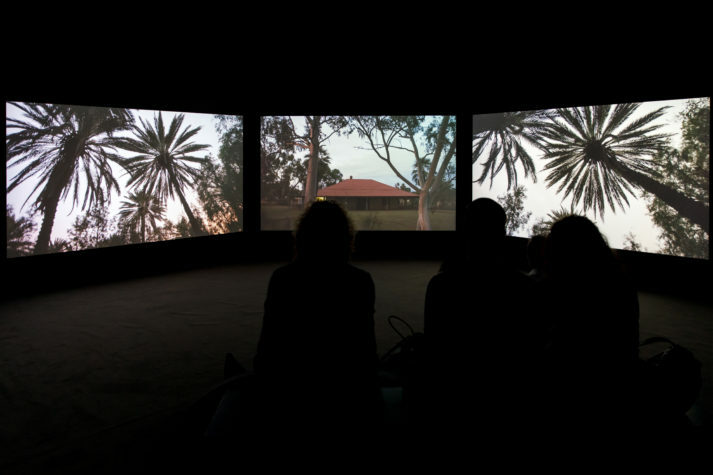 A monumental video-triptych immerses the viewer in an oasis in the Pilbara desert, in north-west Australia. Invasive plants play the main protagonists here. Since their transplantation by British colonists, they have taken over the only constant water resource in the area, which is sacred to the indigenous, Yindjibarndi people. Today, the waterlilies form the centrepiece of the colonial garden, which is renowned for its picturesque beauty. However, the plants are an invasive alien species, which present a lasting threat to the ecology of the land. In the meantime, Yindjibarndi and non-indigenous rangers try to keep the plants under control. With surreal landscape imagery, Mata Dupont hints at the conflicting realities and values that struggle to coexist. In a spectacular, 15 meter-wide panoramic video, Mata Dupont introduces a masked tap dancer in a setting with fragile porcelain vases on plinths of red earth. The tap dance style is intimately entwined with histories of violence and cultural appropriation: from enforced entertainment for slave traders, via African diaspora culture, Jazz, Irish step dance, ballet and popularisation through white Broadway shows and cinema, it spread across the globe. The choreography symbolizes how cultural forms keep migrating. As the dancer gains confidence in navigating between the tenuous structures around them, their impact on their surroundings becomes inevitable. Mata Dupont’s new work revolves around Kew Gardens in London. In the nineteenth century, these botanical gardens formed the nerve centre of the British Empire: it was the place where plants from the entire empire were studied for their commercial value. Today, these same gardens house the world’s largest seed bank, conserving the most endangered wild plants for future use. Mata Dupont draws us into this world with an adaption of Virginia Woolf’s short story ‘Kew Gardens’, where Londoners wander through the gardens in a dreamy state of half-consciousness. In her adaption of the story, the scientific claims of the gardens are subsumed in an increasingly irrational logic, in which truths and misinformation, colonial histories and our ecological future coalesce. The works in this exhibition would have been unthinkable without the permission and support of the Yindjibarndi and Badimia peoples. The works were realised with the cooperation and/or financial support of Yindjibarndi Aboriginal Corporation; the Department of Parks and Wildlife, WA; the Royal Botanic Gardens, Kew; the Millennium Seed Bank; Wexner Center for the Arts, Ohio, USA; the Department of Local Government, Sports and Cultural Industries, Western Australia; FORM Gallery, Perth; Bright Yellow Productions; Transport for New South Wales and Cultural Capital as part of the Wynscreen program, Sydney; Mondriaan Fund.